Stark, gritty prison dramas don’t get any better than this. 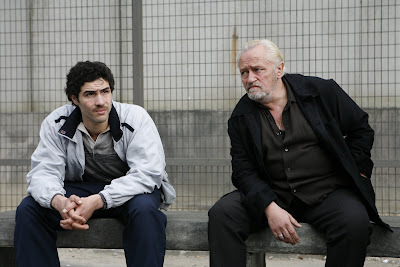 We may have seen similar stuff on television shows like Oz, but Un prophète (A Prophet) is like a self-contained miniseries set in a French prison with an Arab protagonist, Malik El Djebena, convincingly portrayed by Tahar Rahim. The illiterate 19-year-old Malik arrives in prison for assaulting a policeman and becomes drawn into and then entrenched in a criminal way of life. The resulting tale has an epic quality to it. It avoids the typical Hollywood three-act structure that often makes films quite predictable. Malik’s journey takes many twists and turns, and unfolds over many years. The title would seem to be a reference to the film’s Islamic content, and an indication that Malik’s journey isn’t a Christian allegory but a Muslim one. Some may feel that it’s too long at 2-and-a-half hours, but it’s the length it needs to be. It wouldn’t have the same scope, naturalism, intensity and depth if director and co-writer Jacques Audiard had hurried the pacing. He gets it right and his directing is very skilled and assured. Audiard recruited a smoldering Niels Arestrup from his previous film De battre mon coeur s’est arête (The Beat That My Heart Skipped) to play the leader of the prison's Corsican gang, César Luciani. But we really get a sense of what it is like for Malik to get sucked into that way of life. It reminds me of how someone once told me that his time in prison was like doing a PhD in crime, and that it was like studying with some of the most brilliant evil geniuses. Many tough-on-crime pundits don’t consider that when they scream for mandatory and longer sentences. In many cases, we’d just end up with better, more skilled criminals. At last week’s Academy Awards, Un prophète was considered a strong contender for Best Foreign-language Film along with the German film Das Weisse Band (The White Ribbon). Both had won major prizes at the Cannes Film Festival, the Grand Prix and the Palme d’Or respectively. Of course, Un prophète was the big winner at France’s César Awards on February 27, but it also took major awards such as the Foreign Film BAFTA Award. I myself picked it as one of my top 10 films of 2009. The victory for the unheralded Argentinean film El secreto de sus ojos (The Secret in Their Eyes) at the caught many people by surprise. Most people haven’t seen it yet, including very prominent critics like A. O. Scott. But what makes the Foreign Film category so unpredictable is that it is one of the few that require voters to attend special screenings to prove that they’ve actually seen all the films before voting. Frankly, all of the categories should require that, and it is outrageous to think that Academy members can vote on some categories where they haven’t seen any of the nominees. But that’s a whole other discussion.